Muffins Reveal Epigenetic Impact of Saturated and Polyunsaturated Fats on Our Bodies | What is Epigenetics? Muffins – not only are they delicious, but they offer valuable insight into how different foods we eat might alter our DNA. New research that builds off of the popular “muffin study” that was published a few years ago suggests that eating a certain type of fat may actually adjust marks on your DNA and contribute to the way your body stores fat. We often hear that saturated fat – found in butter, cheese, cream, chocolate, and sausage, for example – is bad because it doesn’t build as much muscle and is more fattening than polyunsaturated fats. Oily fish, algae, nuts, and some oils like rapeseed or sunflower are common sources of polyunsaturated fats. Research is now showing that there is an underlying epigenetic mechanism at play which affects fat accumulation in areas like the liver and abdomen depending on the type of fat you consume. Thirty nine participants in the 2014 muffin study consumed three muffins a day for seven weeks. One group ate muffins that were baked using palm oil, a saturated fat, and the other group ate muffins that were baked using sunflower oil, a polyunsaturated fat. Importantly, the muffins contained the same amount of carbohydrates and protein – the only difference was the type of fat used. Ultimately, they found that gaining weight from eating excess calories from muffins with polyunsaturated fat led to more gain in muscle mass, and less body fat than overeating a similar amount of saturated fat. In a new study, researchers Ulf Risérus and Charlotte Ling from Uppsala University and Lund University in Sweden collaborated with the investigator of the major muffin study to assess epigenetic changes in fat tissue. Specifically, they looked at an epigenetic mark known as DNA methylation and discovered that the epigenetic pattern of over 3,000 genes had changed as a result of the study, which showed differences in individuals that consumed polyunsaturated fat compared to saturated fat. “We believe that the discovered epigenetic changes, depending on the type of fat they ate, could contribute to the difference in fat storage, in which saturated fat has a more negative impact,” explained Charlotte Ling. DNA methylation, the most well-known epigenetic mechanism, is defined as the addition of a methyl group onto DNA that suppresses the expression of genes, thereby impacting their function. Many environmental factors have the ability to influence the presence of this epigenetic mark and researchers continue to uncover what triggers this mechanism in numerous aspects of our lifestyle. “It is fascinating that polyunsaturated fat seems to have completely different molecular effects compared to saturated fat; effects which in turn could potentially have an impact on both the body’s fat storage and metabolism,” said associate professor Ulf Risérus, who worked closely on the study. Polyunsaturated fat was also linked to improved carbohydrate metabolism in the body. “It would now be interesting to learn whether the epigenetic effects of polyunsaturated fat could be involved in an improved carbohydrate metabolism,” Ulf Risérus noted. 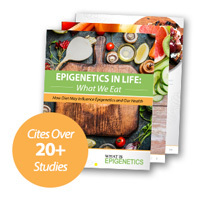 It’s intriguing to see evidence that more and more factors have an epigenetic influence on our health. In light of these studies, we can make informed improvements in certain aspects of our lives as we strive for better health, such as eating less saturated fat or exercising more. Source: Perfilyev, A. et al. (2017). Impact of polyunsaturated and saturated fat overfeeding on the DNA-methylation pattern in human adipose tissue: a randomized controlled trial. The American Journal of Clinical Nutrition, 105 (4): 991. Reference: Lund University. New findings may explain the advantages of polyunsaturated fat. News and Press Releases, 8 May 2017. Web.